The Parabellum-Pistole (Pistol Parabellum), popularly known as the "Luger", is a toggle-locked recoil-operated semi-automatic pistol. Designed in 1898, it was one of the first semi-automatic pistols, which uses a jointed arm to lock, as opposed to the slide actions of almost every other semi-automatic pistol. The Luger is well known from its use by Germans during World War I and World War II, along with the interwar Weimar Republic and the post war East German Volkspolizei. 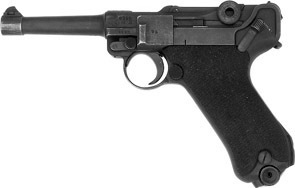 Although the Luger pistol was first introduced for use with a 7.65×21 mm Parabellum round, it is notable for being the pistol for which the 9×19 mm Parabellum round (also known as the 9 mm Luger) was developed. Although outdated, the Luger is still sought after by collectors both for its sleek design and accuracy. Thousands were taken home by returning Allied soldiers during both wars, and are still in circulation today. 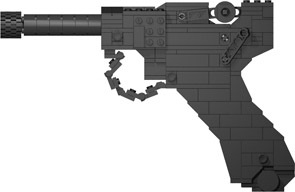 The BrickGun Luger P08 continues our decade-long tradition of creating the most realistic, full-scale replicas of handguns modelled with plastic building bricks. Like all of our models, it matches the dimensions of the real weapon almost identically and sports realistic mechanical features. It is our first 3-stud-wide model, made possible due to the unique cocking mechanism which does require a slide, so the width of this design is closer to reality than any of our other handguns. The coolest feature of the model is the cocking arm and the fact that it not only moves back and up like the real thing, but it also works as it does on the actual gun, readying an internal hammer, which falls with an audible "click" when the trigger is pulled. We're delighted with our solution to replicate this real-world design which maintaining the proper scale. The Luger is also one of only 2 of our handgun models which also incorporates a functioning safety. 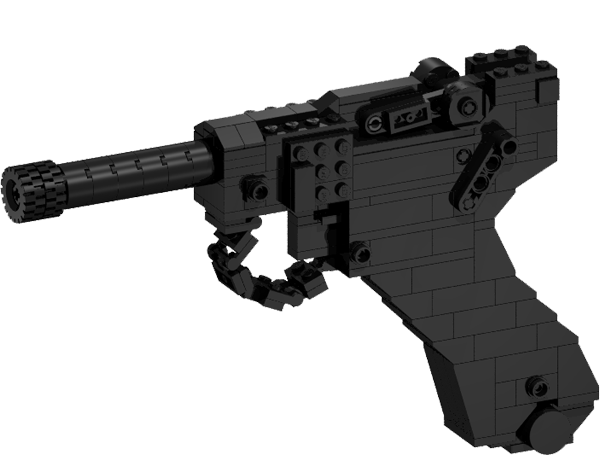 Once the gun is in a cocked state, flipping the safety engages an internal block which prevents the trigger from being pulled. The Luger is one of our most-requested models, and now you can have one of your own!